Photograph, front of the De Luxe Theater, where the show was held. Image available on the Internet and included in accordance with Title 17 U.S.C. Section 107. DE LUXE SHOW. The De Luxe Show, one of the first racially integrated exhibitions of contemporary artists in the United States, occurred in the remodeled De Luxe movie theater in the Fifth Ward, Houston, from August 22 to September 29, 1971. The Menil Foundation sponsored the exhibition at a time of a nationwide controversy on opportunities for black artists. In 1968 the Black Emergency Cultural Coalition was formed to lobby for greater exposure of black artists and involvement of black expertise in curating exhibitions after the Metropolitan Museum of Art (New York) organized the exhibition Harlem on my Mind with only limited input from Harlem artists. In 1971 the coalition called for a boycott of the Whitney Museum's exhibition Contemporary Black Artists in America because black participation in its organization was limited. Fifteen of the seventy-five artists scheduled to participate subsequently withdrew, and critical response to the exhibition centered on black political reaction, with little discussion of the art itself. An increasing number of black artists thought that their work should be evaluated on the basis of aesthetics. Two exhibitions organized by the Menil Foundation in 1971 for the Institute for the Arts at Rice University provided the immediate backdrop for the De Luxe Show. Some American History (February-April 1971), an exhibition on slavery and black life in America, was criticized in the national press for focusing on the work of white artist Larry Rivers; the six black artists who assisted Rivers were dissatisfied with their role in the project. The controversy surrounding Some American History undoubtedly shaped the Menil Foundation's decision to call on black leaders to coordinate the De Luxe Show. For Children (May-August 1971), a popular exhibition that encouraged playful interaction with paintings and sculpture, prompted the idea of exhibiting black art in one of Houston's poor neighborhoods. 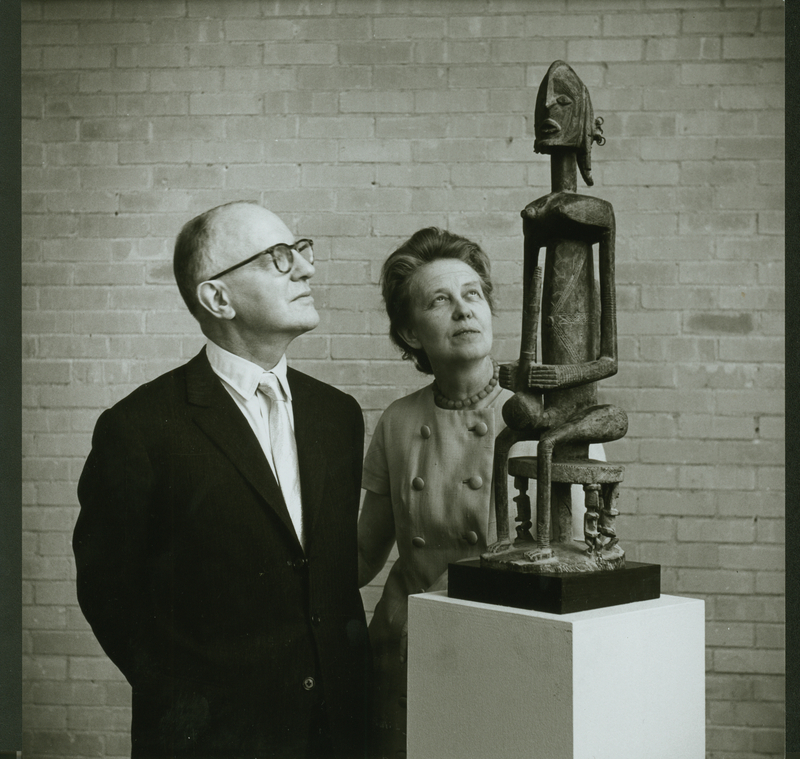 Photograph, Picture of John De Menil, art patron, and his wife. Courtesy of Alchetron. Image available on the Internet and included in accordance with Title 17 U.S.C. Section 107. John De Menil, businessman and art patron, initially approached painter Peter Bradley, an associate director of the Perls Galleries in New York, with the idea of displaying black art in one of Houston's poor neighborhoods. Bradley, who had participated in Some American History, emphasized the need for an integrated exhibition, and agreed to curate the show after the decision was made to include artists of both races. De Menil also enlisted the aid of two instructors from Texas Southern University: Jefferee James, who publicized the show, and community leader Mickey Leland, who helped to select the site and coordinate the exhibition. The De Luxe Theater, located at 3303 Lyons in the heart of the Fifth Ward, was a historically rich site for the event. The De Luxe had provided a safe, family-oriented alternative to other black neighborhood movie theaters when it opened in April 1941 and was described by Jefferee James as "THE PLACE for people to look forward to, particularly on weekends." The theater had fallen into decay after movie theaters were integrated and finally closed in 1969. With the help of experts from the Rice University Institute for the Arts, Jones and Bynam Construction Company transformed the old theater into an exhibition space in just three weeks. To emphasize the historical significance Bradley left the façade, lobby, and balcony intact. The balcony was walled off so that old westerns and horror movies could be shown there, and the rest of the interior was gutted, sheetrocked, and coated with two layers of white paint for an exhibition area measuring approximately fifty by eighty feet. Two rows of theater seats, the only other remnant of the past, were left in the center of the exhibition space to facilitate relaxed viewing. Photographs of the renovation were displayed in the lobby. Bradley selected forty abstract works by nineteen contemporary artists, some well known and some new talents. Artists Sam Gilliam and Kenneth Noland, prominent critic Clement Greenberg, other community organizers and neighborhood members, and Institute for the Arts staff assisted Bradley. Huge posters depicted the exterior of the De Luxe in black and gray, and flyers, bumper stickers, and newspaper, radio, and television advertisements publicized the event as "hard art at the De Luxe Show." When the show opened on August 22, more than 1,000 people attended to view austere but colorful abstract works by such painters as Peter Bradley, Virginia Jaramillo, Ed Clark, Larry Poons, Jules Olitski, and William T. Williams. Sam Gilliam's sensuously draped canvas Rather (1970) and Alvin Loving's untitled arrangement of brightly colored cubes vied with the minimalist constructions of Richard Hunt, Michael Stiener, and Anthony Caro for sculptural interest. The audience's response to art that was quite challenging, and in some cases rather esoteric, was described by one critic as "somewhat skeptical but usually enthusiastic." Bradley conceded that children unhampered with preconceived notions about art appreciated the exhibition more than their elders. The exhibition was hailed by critic Eleanor Freed as a "challenging social and visual experiment" that brought painting and sculpture to a part of Houston "better known for urban decay than aesthetics." By the time the exhibition closed on September 29, more than 4,000 people had attended the De Luxe Show. The De Luxe Theater continued to serve the community after the exhibition closed. Outstanding examples of African art from the Menil collection were displayed there for three years. Until 1976 the theater also served as a gallery for the Black Arts Center, sponsored by Hope Development, Incorporated. Joseph James Akston, "Editorial," Arts 45 (May 1971). Maurice Berger, "Are Art Museums Racist?," Art in America 78 (September 1990). George Davis, "The DeLuxe Show," Art and Artists 6 (February 1972). The De Luxe Show (Houston: Menil Foundation, 1971). Houston Post/Spotlight Magazine, August 29, 1971. Texas Observer, September 24, 1941. Vertical Files, Dolph Briscoe Center for American History, University of Texas at Austin (John and Dominique De Menil). Handbook of Texas Online, Kendall Curlee, "DE LUXE SHOW," accessed April 23, 2019, http://www.tshaonline.org/handbook/online/articles/kld03. Uploaded on June 12, 2010. Modified on December 15, 2016. Published by the Texas State Historical Association.